Hello and thanks for stopping by Twins Chatter this weekend. As you probably know, we don't usually post on weekends, but I just happened to have the following article readily available. As I probably mentioned last spring, I'm the sports editor for our modest St. Olaf school newspaper, and I often write our weekly opinion column. This week, I chose to write about my specialty, the Twins. Keep in mind that this was written for a wider and a less Twins-literate audience. Despite that, I think it's still a good read. Check back Monday morning when we'll know the Twins playoff opponent and have an original post. In the meantime, have a good weekend. As baseball s regular season draws to a close this weekend, it is both a time to look both back and forward. From April through September, we witnessed innumerable walk-off homers, amazing defensive plays, masterful pitching performances and record-breaking hitting feats. It was truly a season to remember. However, those 162 games were merely the appetizer for the main course that is to follow, namely October postseason baseball. For the third consecutive year, our hometown nine, the Minnesota Twins, will be vying for the coveted World Series trophy. The small-market Twins, whose 2004 payroll is roughly one fourth that of the behemoth New York Yankees, has suffered early playoff exits the past two seasons. However, I firmly believe that 2004 will be different. Mark my words: the Minnesota Twins will represent the American League in this year’s World Series. How, you may be thinking, could you possibly back up that statement? What about the 100-win juggernaut that is the Yankees? What about the Boston Red Sox’s deadly combination of power pitching and power hitting? What about the Oakland Athletics’ quality quartet of starters? What about the fact that no Twin will drive in even 85 runs this year? The answer to all those questions can be summed up with just three words: pitching, pitching, and pitching. Despite some obvious offensive deficiencies, the Twins have the best pitching staff in the American League by a wide margin. It all begins with starting pitching, and the Twins have two of league’s best in Johan Santana and Brad Radke. Santana is a shoo-in to win this year’s American League Cy Young award, and his numbers since mid-June are simply mind-boggling: over his past 22 starts, Santana is 18-2 with a miniscule 1.36 ERA and an incredible 204 strikeouts. Radke is no slouch either; his 3.48 ERA is the league s fifth-best and he leads the league in quality starts. Together, Santana and Radke form a one-two punch that will be tough to topple come October. The Twins bullpen, seemingly decimated by two key free-agent defections this past winter, has been restocked and is better than ever. The team has five different pitchers who regularly top 95 mph on the radar gun, the most notable being closer Joe Nathan and his 43 saves. Nathan—along with fellow bullpen mates Juan Rincon, J.C. Romero, Grant Balfour, and Jesse Crain—comprises what is arguably the league’s best bullpen. If the Twins maintain a lead going into the late innings, these guys almost always keep it that way. Even though it may lag far behind the team’s pitching in overall quality, the Twins offense is balanced and primed for postseason glory. Leftfielder Shannon Stewart is among the league s best lead-off men, and he sets the table for proven run producers Torii Hunter, Jacque Jones, and Corey Koskie. 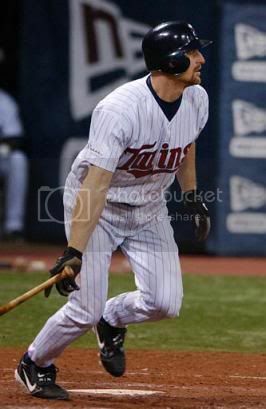 2004 has also seen the emergence of two new young stars: outfielder Lew Ford and first basemen Justin Morneau. Ford, a fan favorite in Minnesota, filled in for an injured Hunter back in April and has never stopped hitting, to the tune of a .302 batting average. Morneau, whose enormous power potential allowed the team to trade disgruntled first basemen Doug Mientkiewicz in July, has been the long-ball threat this team has been sorely lacking in recent years. The burly slugger has hit 18 home runs since becoming an everyday player only two and a half months ago. At only 23 years of age, Morneau evokes memories of the franchise s last great power hitter, the legendary Harmon Killebrew. Another reason why 2004 will be known as “the year of the Twin” is the numerous weakness that are to be found in their playoff competition. While the Yankees’ win-loss record looks good on paper, their paper-thin starting staff leaves much to be desired. The Red Sox are a team seemingly built for the postseason, but they will most likely open the playoffs at the Metrodome against Santana and the Twins, a tall order for any squad. The American League Western Division champion—whether it be the Athletics, Angels, or Rangers—is severely flawed in multiple areas, and can hardly be considered favorites no matter who they take on in the first round. It is for all these reasons that I believe the Minnesota Twins will prevail in this fall s postseason dogfight. As the old saying goes, good pitching always beats good hitting. If you re a Twins fan, that’s one statement you can hang your hopes on this October. 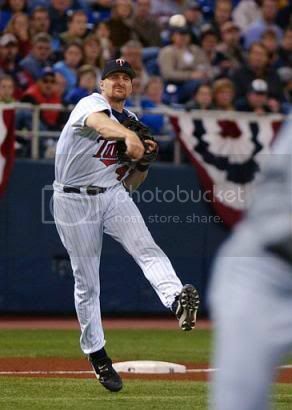 Corey Koskie had a great game Friday, going 3-4 with a homer and 3 RBIs, as the Twins beat the Indians 4-3. 1. Three different Twins pitchers blew three different leads: Radke blew a two-run lead in the fourth, J.C. Romero blew a one-run lead for Radke (again) in the sixth, and Grant Balfour blew another one-run lead in the seventh. Except for Juan Rincon (who threw two impressive hitless innings) the Twins bullpen has looked very vulnerable the last few games, which is definitely not a good sign going into next week. Romero in particular is a troubling case, as he allowed yet another home run to a lefty, which will absolutely KILL you in Yankee Stadium. 3. Most importantly, yesterday’s loss means that the Twins no longer control their own fate as it pertains to home field advantage in the ALDS. Oakland, Anaheim, and the Twins now have identical 90-69 records, and the Twins do not own the tiebreaker (head-to-head record) with either team. That means in order to avoid traveling to the Bronx once again this year, the Twins must sweep the Indians this week and hope neither Oakland nor Anaheim sweeps each other. Up until yesterday, I was fairly optimistic that the Twins would gain home field, but now it seems an unlikely possibility. The fact that the team was the Yankees who swept the Twins doesn’t help either; the Bombers are cocky enough as it is and don’t need any more reassurance of their perceived superiority. Here are some alarming stats for you to chew on: in his eight appearance since his team-record scoreless streak ended on September 12, J.C. Romero has thrown 6 1/3 innings, allowed 12 runs (9 earned), 12 hits, walked 8 batters, and has surrendered 3 home runs (one each his past three outings). In that span his ERA has risen a solid 2.59 to a mediocre 3.48. Those numbers, frankly, are amazingly bad and cause for extreme concern for Gardenhire and the Twins. We all know how fragile J.C.’s psyche is, and it has been well documented that mental barriers have been a huge part of his struggles over the past two years. You could plainly see Romero’s frustration as he left the mound last night (you could also read it on his lips), which is a bad, bad sign. However, what is to be done? The postseason begins next Tuesday, and there is no room for head cases come October. J.C. is an extremely talented pitcher with great stuff, but can he be trusted to regain his composure without another wake-up call back in AAA? Obviously Rochester isn’t an option at this point, which makes the timing of J.C.’s current meltdown extremely inconvenient. Can Gardy safely use J.C. in the playoffs? Or should other options (like Crain or Mulholland) be explored? There is no doubt that it is imperative Gardy send J.C. out there once or twice against the Indians this weekend, because right now I have no confidence in his abilities. LaVelle E. Neal is reporting that AAA pitching coach Bobby Cuellar is going to work with J.C. this weekend. Hopefully something clicks, because this team will be hurting without its key lefty in the ‘pen next week. That’s all the Twins Chattering I’ve got for you all today. Yesterday, I hinted that today would be a monumental day, but I was mistaken. That monumental event has been moved to Tuesday, which promises to be a fine day indeed. I will also have a little bonus material posted here for Saturday, so you are all invited to stop by and check that out as well. Have a good one. Twins lost 6-4 to the Yankees, who have clinched the AL East outright. The Twins are now 90-69 and tied for the second-best record among AL division leaders. Anaheim, who lost to Texas 6-3. The A’s and Angels are both 90-69. The two teams will play each other for three games this weekend, with the winner of the series taking the AL West crown. If either team sweeps, they will also have home field advantage in the ALDS. Boston did not play but is assured the AL Wild Card. Los Angeles defeated Colorado 4-2 in 11 innings. They are 3 GA of San Francisco in the NL West. Their magic number is 1 as they host the Giants this weekend for three games. San Francisco beat San Diego 4-1. The Giants are 3 GB Los Angeles in the NL West and tied for the Wild Card tie with Houston. Note – Jerome Williams, pitching for the first time in 2 months, threw 7 strong innings. Houston did not play, remains tied with SF for Wild Card. They host Colorado this weekend. Chicago lost their third straight game to Cincinnati 2-1 in 12 innings. The Cubs are 1 GB Houston and San Francisco in the Wild Card race. Note – Mark Prior threw his best game of the season, 9 IP w/1 ER, in the losing effort.